Horror meets baking in a cake designed for - of all people - Alice Cooper. There are lots of words you can use to describe the Silent Hill games, but delicious probably wouldn't be one of them. Terrifying perhaps, but tasty? Maybe not. That hasn't stopped cake designer Laura Edwards from constructing a confectionary sculpture made up of chocolate, butter cream, and fear. Edwards based the design on nurses from the Silent Hill movie. She used a stack of six rich chocolate cakes covered in a white chocolate cover paste for the main body of the cake. The arms and chest are made of Rice Krispie Treats, also covered in the white chocolate paste. Finally, Edwards used food colorings and pastes to add detail to the cake. 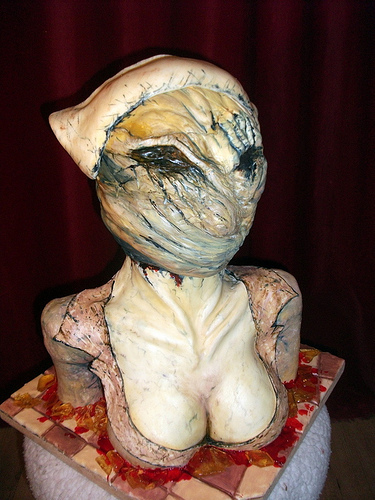 The cake was created as the centerpiece for a Silent Hill-inspired cake installation at the Alice Cooper Freakshow auditions in Hyde Park in London earlier this week. Edwards said that she loved making the cake, and that it was a real privilege to make something for Alice Cooper. It's pretty impressive to look at that picture and know that the bust is basically made of food. Part of me want to know how it tastes too, but another part of me never wants anything like that near my mouth. Ever.